Updating the corporate thing: Ralcorp (the old Ralston-Purina company that was left after Nestle bought out the pet foods) did buy Post but ended up dumping the company. Post Foods is now a small private company. Ralcorp was purchased by ConAgra in 2015. Regardless of where they list the corporate offices on the cereal boxes, the main factory has always been in Battle Creek, Michigan, across town from Kellogg's. With six kids, these were a staple at our house in the 1960s. One day a week, usually Saturdays, we were allowed to have "sugar-coated" cereals - as my mom called them - for breakfast. Alpha-Bits and Crispy Critters were the most popular. 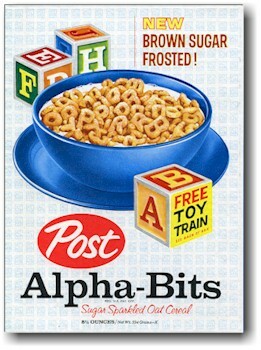 ralcorp took over the post cereal brands and discontinued alpha bits and post toasties.